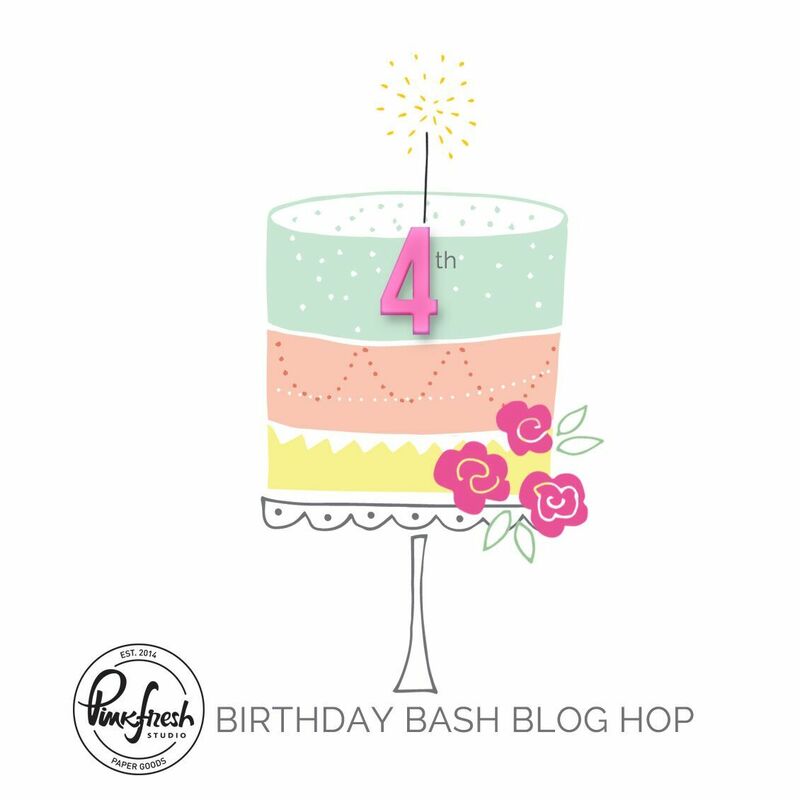 Ashley Horton Designs: Pinkfresh Studio 4th Birthday Bash Blog Hop! Hi there, and thanks for joining in the fun as we celebrate Pinkfresh Studio's 4th Birthday!! There's lots of inspiration along the hop and some awesome prizes up for grabs, so don't miss out! Before I share my layout with you, let's talk GIVEAWAYS!! A prize will be given away on each Blog, so make sure you comment on each Designer's post. 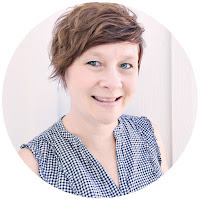 One winner from my Blog will win $40 in Pinkfresh Studio products!! Comments for the giveaway will close on April 9th, at 12:30PM PST. You will need to check on the Pinkfresh Studio Blog to see if you are one of the lucky winners! You also have the chance to win a $100 Gift Certificate to the Pinkfresh store by leaving a comment on the PF Studio Blog. And...there are also chances to win on Instagram!! One winner will receive a $100 Gift Certificate to the Pinkfresh Studio store, by reposting the PF Birthday Bash IG Story. A winner will be selected within 24 hours. Last, but not least, there will be a Stamp and Die bundle giveaway on the PF Studio Instagram as well! WOW!! That's a lot of Pinkfresh goodies up for grabs!! Good luck! 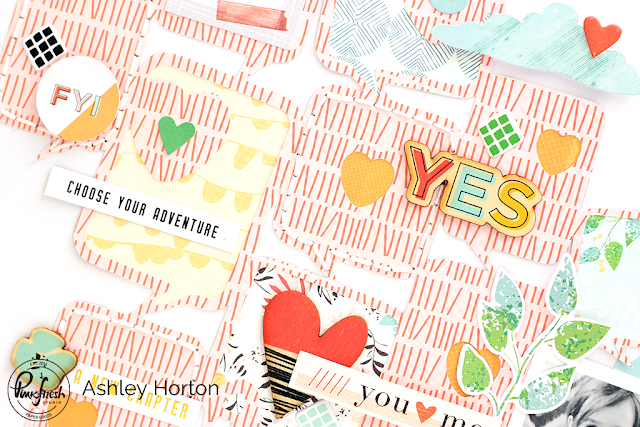 Now for a look at the layout I created, using the new Let Your Heart Decide collection. It's one of my new favorites, for sure!! I love everything about all of the embellishments in this collection, so I used as many as I could over a cut file in the background! The colors in this collection are great! I love that they work for feminine, masculine, or just everyday layouts. If you're just now joining in the Hop from my Blog, here's a full list of the Hop order, so you don't miss out on any chances to comment. Ashley, this is fabulous. LOVE your use of color....such a sweet pic! Precious picture. Happy colors. Love it! Aww! Such a sweet picture and layout! Such an inspiring layout, I really like this! Great layout, Ashley! Thanks for sharing! Great layout! The colors work well together. Thanks for sharing and have a wonderful week. Love your use of all those callouts in one layout! Your cut files are always winners! Very unique layout! great job with the colors. 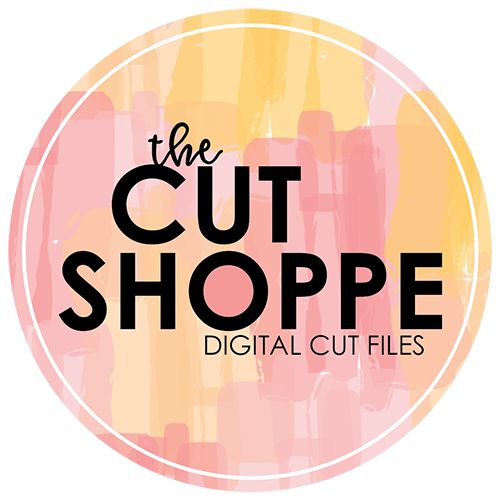 I will have to visit your Etsy Shoppe as I am always looking for digital files to use in my cardmaking and mixed media projects. Thanks for sharing and for the chance to win in this hop! Thanks so much Donna! I would love for you to visit the shop. :) There's a lot of different designs to choose from!! Awesome layout! It is sweet yet fun! Wow, that's a really cool, modern layout. Love this layout! Super modern and sweet! WOW!!! Now that is a LAYOUT!!! fantastic job! You always seems to *WOW* me with your fabulous pages! Loved your layout! It is cool how it is not cookie cutter styling thanks for the inspiration! Fun page. Nice use of all those embellishments. Wonderful photo and awesome layout! Love all the bright, happy images! Beautiful layout. I love all the "action". Great job. Amazing layout! I love how you see new elements every time you look at it. It's a page that keeps on giving! What an interesting and lovely design! It really caught my eye and is just wonderful! Beautiful LO. Delicate colours for a sweet image. I love all the fun embellishments that you used and adorable photo!! Wow, love all the embellishments - they are my favourite in this collection too! So great! Lots of fun things going on here. Beautiful page! great use of the pp! Love your bright, colorful layout. Sweet layout - love the colors. Very lovely, love the layers. Fun layout! I like all the speech bubbles. 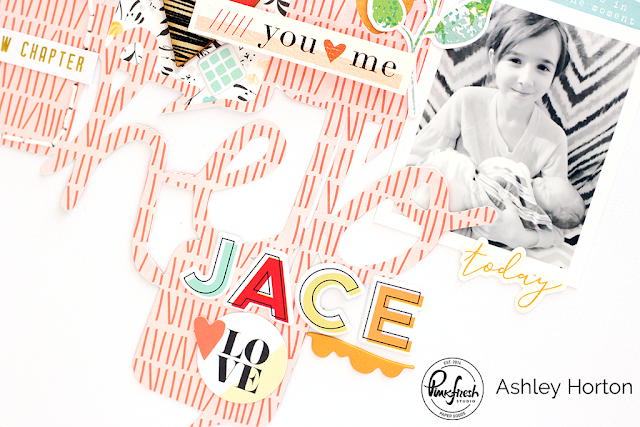 Fabulous layout, Ashley! I love all the cute embellishments...very eye-catching!! Love the pic for your layout and the details are all so cute! Even though I am not a scrapbooker, I can appreciate a good layout. The photo is adorable! Such a cute layout. I love the colors and all the embellishments. So many fun elements. Thanks for sharing! What a fun page! It really brightened my day. What a fun page! Beautiful photo. This so pretty . Love your design and your creation. Love the layout and the colors ! They look so happy and sweet ! Thanks for the inspiration. Your layout is gorgeous, so unique! I love it~thanks for sharing. What awesome details! I just love this pretty page! What a whimsical and happy layout! What a fun layout! Thank you for sharing! Superb layout those speech bubbles look so fun ! Wow, impressive layout! Thanks for sharing this for the hop! This is a wonderful layout. I love the way you used so many diecuts and embellishments over the cut file. Thanks for sharing this! This is just gorgeous! I love all the little extras you added! interesting layout. I take it that this is on a 12x12 white background? I had a hard time focusing in - my eyes just went everywhere and finally found the little girl. possibly needs a colored background? What a super fun and different layout. Great layout, I love how you used color and that cut file to support your embellishments! And the pattern really makes the pattern in the picture pop in contrast! Super love how colourful and vibrant the page is and how you used a black and white photo with this layout because it really draws you attention to the picture. Wow! Gorgeous layout! Love it!!! Ashley, this is lovely! I just received my Let Your Heart Decide collection pieces and you've already inspired me to make something awesome! I'm loving your layered elements. Love this layout, the colours are amazing! Such a sweet picture and a very fun design. Love the bright colors, so fun! wow. I am so crushing on your layout!!! So sweet! I love the cut file and the papers! I just broke out in the biggest grin. What a cute picture, and what a really interesting way of laying out this page. I would never think of doing something like this, but I love how it turned out. Thanks for sharing with us; I'm going to have to stretch myself and try a card based off this! What interesting work! I don't even know what to focus on, it's all lovely. Fabulous layout!! Love the group of speech bubbles!! I love the embellishments and color theme! Something I would totally use to create for someone special too! This is such a beautiful layout with a fab colour palette. Such a great layout! Sweetest picture! Don’t know why but I absolutely love using a black and white photo on a colourful background for a layout. Thank you for the inspiration. What a darling pic and super fun layout for it!! Wow, what a job! It is a page super fun! That’s a lovely and very unique layout ! This is so fun! It's very creative and vibrant...which I love!